Because they may be contaminated with Listeria monocytogenes, J.J. Fuds, Inc. has voluntarily recalled one lot of its frozen, raw Premium Natural Blends Chicken Tender Chunks. The affected products were sold in 5-pound bags distributed in Illinois, Indiana, Michigan, Minnesota and Wisconsin. The organism Listeria monocytogenes can affect animals who eat the contaminated products, and there is also a risk to humans who handle the products, especially if they do not thoroughly wash their hands (and any surfaces the product touched) afterward. Listeria monocytogenes can cause serious and sometimes fatal infections in young children, frail or elderly people, and others with weakened immune systems. The symptoms for both people and dogs include high fever, stiffness, nausea and diarrhea. If you or your dog have these symptoms after touching or eating the recalled product, see a doctor or veterinarian. J.J. Fuds, Inc., which is based in Valparaiso, Ind., announced the recall yesterday, after a routine sampling program by the Michigan Dept. of Agriculture and Rural Development resulted in a positive test for Listeria monocytogenes. 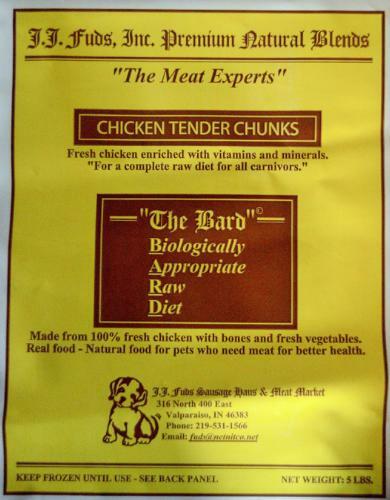 The company has not received any reports of dogs or people becoming ill from the products. If you purchased the recalled Chicken Tender Chunks, return them to the retailer for a refund and proper disposal. For more information about this recall, call 888-435-5873 (Monday through Friday, 8 a.m. to 4 p.m. CST) or visit jjfuds.com.